Sorry, we are currently sold out of 'Ecuador Finca Frajares'. Please check back later. Arrived late May 2017 in grainpro and a first offering. Ecuador is still an undiscovered gem in the world of specialty coffee. 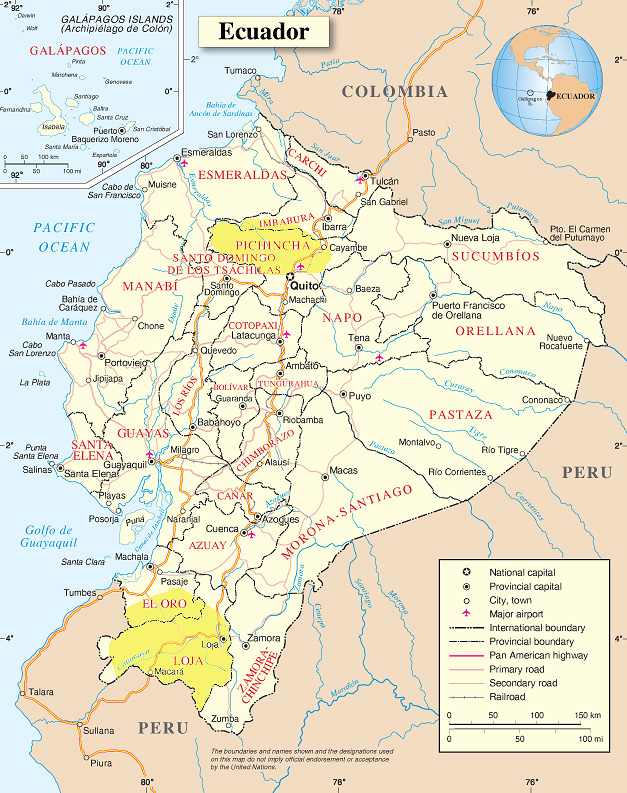 Once part of Colombia, Ecuador is surrounded by Colombia to its north and east, by Peru to its south and east and the Pacific Ocean to its west. Ecuador, as its name translates, straddles the equator and is also extremely mountainous with rich, volcanic soils. Some of the highest peaks in the Americas are there as well as some of the highest coffee regions on earth, which can only be realized at or very near the equator. Not all coffee grown in Ecuador is at high elevation but those which are have smaller, more concentrated flavors and denser beans. There are two principal coffee growing regions in Ecuador, Pinchicha in the north, a few hours from the capital Quito, and Loja Province in the South not far from the border with Peru. These two regions duke it out for honors. We have been to and cupped our way through both areas, realizing there is a lot of great coffee to be had. Finca Frajares coffee is grown in the rich northwestern part of the province of Pichincha in Nanegalito, about an hour and a half drive to the northwest from Quito. The farm is located at 1,700 meters and its special climatic conditions give their coffee some surprising flavors and aromas. Cup Characteristics: Very lively, super clean and clear cup. Lemon and green apple acidity. Floral rose petal on the nose. Butterscotch, caramel notes with juicy mouthfeel. Long, dry finish. An elegant cup. Roasting Notes: Bright, high grown, dense and large beans make for the ability to span multiple roasting darkness levels. We always favor lighter roasts, our personal preference, for exhibiting nuance flavors and brighter acidity. That would make a City+ roast a good choice here. However, if you prefer darker (or lighter) coffee then these beans can handle it.